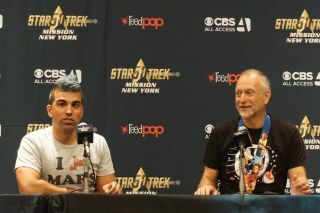 Bobak Ferdowski (NASA, left) and Dan Werthimer (University of California, Berkeley, right) discuss astrobiology, astrophysics, and "Star Trek." NEW YORK — Is anyone else out there? Humans have asked this question ever since we could look up at the stars, but hundreds of thousands of years later, we still don't have a satisfactory answer. Logic would seem to dictate that there's other intelligent life out there, and yet it also suggests that if there is, it may have found us by now. While we may not have an answer for another few decades — if ever — we are slowly but surely getting closer. If we were to find life on Europa, Ferdowski and Werthimer explained, it would most likely be primitive. Humans may appear to be the dominant species on Earth, after all, but our overall biomass is pretty small when compared to wildly successful organisms such as bacteria, or even insects. "Europa [may be] completely covered in water," Werthimer explained. "That's great for primitive life, but if you want technology, you've got to have some land surfaces as well." Organisms on Earth, he said, have evolved to fill even the most extreme niches, "but it won't necessarily evolve into something more complex than single-celled life … What are the pressures that make you want to go from 'I can feed' to standing and talking?" In fact, the relative likelihood of finding primitive versus sapient life was one of the recurring themes of the talk. Werthimer believes that humanity may confirm the existence of primitive extraterrestrial life within the next 20 to 30 years, especially if scientists can get missions to Europa, but technological life is harder to pinpoint, as we don't know how often it occurs. Another potentially limiting factor is that intelligent life does not necessarily equate to technological life. Ferdowski and Werthimer pointed out that intelligent life (with varying degrees of what scientists would call "intelligence") has evolved many times on Earth. Humans are the most obvious example, but dolphins, octopi and crows are all fairly clever creatures, to say nothing of the other great apes, which share a lineage with humans. Even if there's another technological civilization somewhere nearby, scientists are not exactly sure how to contact them. Radio signals seem like a safe bet; indeed, nearby stars have already seen "The Simpsons" and "I Love Lucy" from Earth's TV broadcasts. On the other hand, while radio signals travel at the speed of light, that won't do much good for an exoplanet that could be tens of thousands of light-years away. Ferdowski and Werthimer contrasted the Drake Equation, which suggests that sapient life in the universe should be at least somewhat common, and the Fermi Paradox, which questions why alien life is not observable if the universe teems with it. One potential answer to the Fermi Paradox includes an alien version of the "Star Trek" Prime Directive, which prohibits interference with less advanced cultures. Another suggests that not all technological civilizations are necessarily driven by exploration, and may have directed their efforts inward to cultural matters instead. Assuming that scientists can find life, however, there is (at least) one very important question to answer: Does it resemble humanity on a genetic level? "Did it have a different biogenesis?" Ferdowski asked. "If it's exactly the same as us, that probably doesn't mean there were two independent origins of life." In other words, if scientists find alien life that follows the basic biological dogma, such as translating DNA to RNA to proteins, it's very likely that all life in the solar system originated from a common precursor. This theory, known as panspermia, suggests that extraordinarily simple, hardy life (or proto-life) could travel between planets aboard asteroids or other interplanetary debris. While this is harder to do once you get outside of a given solar system, it's entirely possible that life on Earth and, say, Europa could have originated from the same predecessor, the researchers said. While Ferdowski and Werthimer did not come to any hard conclusions as to whether or not humanity can expect to find life, they did say that the question has far-reaching consequences, regardless of the outcome. "It's a profound question either way," Werthimer said. "If we find the universe is teeming with life, we can learn a lot. If we find out that we are alone, that somehow life is incredibly rare out of the trillion planets, that's very profound also. "If we find out we're alone," he added, "that means we'd better take incredibly good care of the precious life here on Earth."